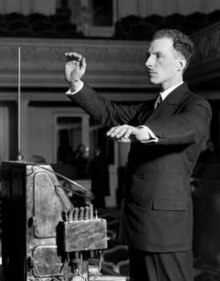 Herbert Russcol writes: "Soon he was intrigued with the new sonorities he could achieve by recording musical instruments and then superimposing them on one another." 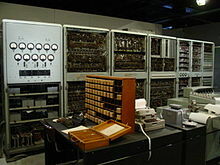 Ussachevsky said later: "I suddenly realized that the tape recorder could be treated as an instrument of sound transformation." 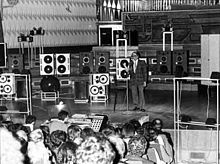 On Thursday, May 8, 1952, Ussachevsky presented several demonstrations of tape music/effects that he created at his Composers Forum, in the McMillin Theatre at Columbia University. These included Transposition, Reverberation, Experiment, Composition, and Underwater Valse. In an interview, he stated: "I presented a few examples of my discovery in a public concert in New York together with other compositions I had written for conventional instruments. "Otto Luening, who had attended this concert, remarked: "The equipment at his disposal consisted of an Ampex tape recorder . . . and a simple box-like device designed by the brilliant young engineer, Peter Mauzey, to create feedback, a form of mechanical reverberation. Other equipment was borrowed or purchased with personal funds." Released in 1970 by Moog Music, the Mini-Moog was among the first widely available, portable and relatively affordable synthesizers. 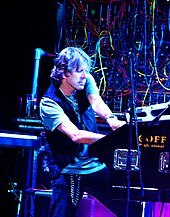 It became once the most widely used synthesizer at that time in both popular and electronic art music.Patrick Gleeson, playing live with Herbie Hancock in the beginning of the 1970s, pioneered the use of synthesizers in a touring context, where they were subject to stresses the early machines were not designed for. Holmes, Thom (2012). Electronic and Experimental Music: Technology, Music, and Culture (4th edition). New York, NY: Routledge. ISBN°�978-0-415-89646-7. (cloth); ISBN 978-0-415-89636-8 (pbk); ISBN 978-0-203-12842-8 (ebook).